Lake Thurmond is a huge 70,000 acre reservoir built on the Savannah River in 1954 by the U.S. Army Corps of Engineers for flood control and power production. Located on the South Carolina Georgia border, Lake Thurmond is the third lake in a string of lakes on the Savannah River owned by the Corps. This lake is a very popular lake and also has little development around its shoreline. The lake is very wide and is a great place to water ski. There are numerous lakeside b ...Learn more here! There are numerous lakeside businesses located here. There are three South Carolina State parks located on this lake. In addition, there are many boat ramps, places of lodging, marinas, and restaurants. Lake Thurmond is one of the 10 most visited Corps lakes in the nation, serving about seven million visitors annually. 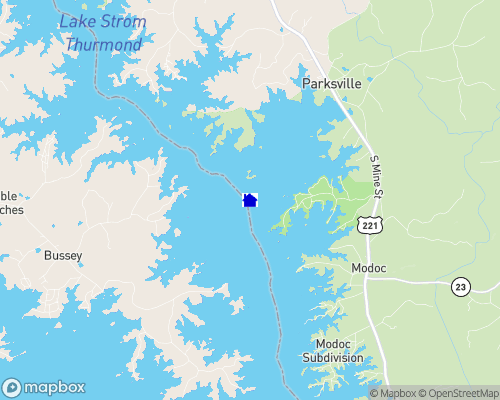 South Carolina Lakes.net provides information on all of lakes in the state. You can buy lake maps, see lake photos or purchase books on South Carolina outdoor recreation. Striper fisherman especially love this lake. The state record striped bass of 55 lb and 12 ounces came from here in 1993.